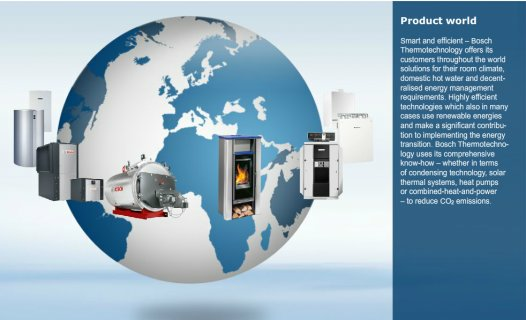 Worcester, and Bosch Commerical & Industrial Heating are both trading names of Bosch Thermotechnology Ltd.
Bosch Thermotechnology Ltd. is the UK’s and Ireland’s operation of the Bosch Group's heating and hot water division. All rights reserved. Text, images, graphics, sound, animations and videos as well as the arrangement of the same on Bosch websites are protected by copyright and other commercial protective rights. The content of these websites may not be copied, disseminated, altered or made accessible to third parties for commercial purposes. Some Bosch websites also contain pictures subject to third party copyrights. Unless otherwise specified, all trademarks on Bosch web sites are protected under trademark law. This applies, in particular, to Bosch trademarks, type signets, company logos and emblems. The marks and design elements used on our sites are intellectual property of Bosch Thermotechnology Ltd. This website was compiled with utmost care. Bosch Thermotechnology Ltd. can nonetheless not vouch for the accuracy of the information provided. Bosch Thermotechnology Ltd. hereby precludes all liability for damage resulting directly or indirectly from use of this website, except in the case of wilful misconduct or gross negligence on the part of Bosch. The intellectual property contained in the Bosch web site, e.g. patents, marks and copyrights, is protected. This website does not grant a licence for use of intellectual property of Bosch or third parties. Bosch Thermotechnology Ltd. thanks you for visiting this website and for your interest in our products. All personal data entered on the Bosch website will be stored, processed and, if necessary, passed to companies of the Bosch Group exclusively for the purpose of providing a personal service to you, to send you product information or to submit service offers to you. Lollar is a town in the district of Gießen, in Hesse, Germany. It is situated on the river Lahn, 7 km north of Gießen. The biggest production site of Bosch Thermotechnology is located in Lollar.